ISI Admission 2019: Indian Statistical Institute is a unique institution assigned to the research, teaching, and application of Statistics, Natural Sciences and Social Sciences. ISI Institutes have primarily engaged in Research Statistics and related discipline. Latest Update: ISI Admission 2019 Admit Card is expected to be released today. Keep visiting for more info. Latest Update: ISI Admission 2019 Admit Card Releasing Date and Exam Date has been Rescheduled!! Check the new schedule below. 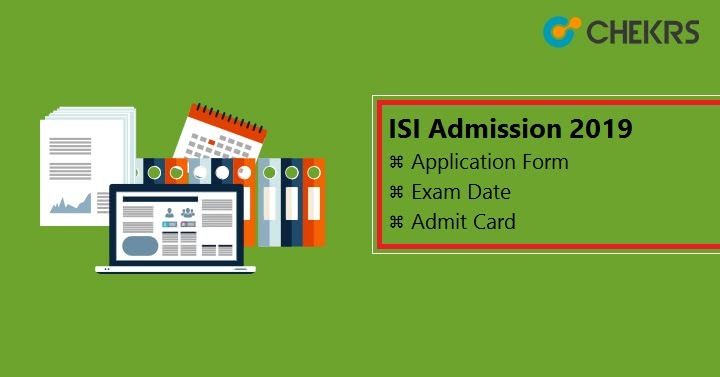 Latest Update: The ISI Admission Application form link is live now, Check Eligibility and Fill the form today. Latest Update: ISI Admission Prospectus Uploaded!! Check the link below. Latest Update: ISI 2019 Exam Schedule Announced!! The application form will be available from 5th February 2019. The Entrance Exam is a national level examination conducted by Indian Statistical Institute which offers admission in various UG,PG And Research-oriented programmes namely- B.Stat (Hons. ), B.Math (Hons. ), M.Stat, M.Math, MS(QE),MS(QMS),MS(LIS),M-Tech(CS),M-Tech(CrS),M-Tech(QROR), PG Diplomas and Research Fellowships programmes. Its campuses are in Delhi, Bangalore, Tezpur, and Chennai where the programmes are studied after getting the admissions in Indian Statistical Institute. Check every detail on ISI Admission Form and other details in this article for all your queries. The Application form will be probably released in the month of February. The applicant will able to fill the form in the online mode on the official site of ISI. Here we are providing the tentative ISI Admission 2019 Schedule. Applicant should follow these details to check their ISI Admission Eligibility Criteria. The applicant has to be a Resident of India and even the overseas candidate can apply. Appearing Candidates should qualify their qualification examination before 01 July 2019. For Master of Statistics: the applicant must have Bachelor degree (3 years) or B-tech/BE degree with Statistics Subjects. B. Math Degree or PGDM (Post Graduate Diploma) in Statistical and Analytics from the ISI Institute. For M-Tech (CS): the applicant must have the Masters Degree in any one of the Mathematics, IT, Physics, Statistics, Computer Application, Computer Science, Electronic science or BE/ B-Tech Degree. For M-Tech (QROR): the candidate must have Master degree in Statistics or Mathematics with Probability and statistics, BE, B.Tech or equivalent. The candidate must have at least 50% marks in 10+2 and at graduation level. For MS (QE): the candidate must have a bachelor degree (3years) in Statistics or Mathematics or Economics or B. Stat form ISI or B-Tech or B.E. For MS (QMS): Bachelor Degree (3 years) in Mathematics or BE / B-Tech. The online application form will be available on the official website of Indian Institute of Statistics i.e. isiscol.ac.in/index.php. On the official website click on the Admission 2019 e. www.isical.ac.in/~admission then it will redirect you to the link of ISI Admission 2019 Application Form http://egov.isical.ac.in:8080/Admission/ . The Application Fees can be paid through both online and offline mode for ISI Admission Application Fees. If you are paying online then you can pay through Net banking Or Debit Card or Credit Card. If you are paying offline you can pay through Bank Challan. The detail of the fees is given below the table. The Exam for the ISI will conduct in the offline mode. There is two paper conducted in the exam. The first paper is of multiple choice and the second paper is of short answer type. For every correct answer, 4 marks will be allotted. The detail of the exam pattern is given below in the table. Type of Questions Both Objective & Descriptive Paper. No of Paper Two i.e. One in the before noon (Objective) and other in afternoon (Descriptive). The Syllabus for Examination for various courses will be different. The Candidates are advised to visit the official website to get updates regards ISI Exam Syllabus 2019 for the course they want to pursue. For all programmes like B. Math or B. Stat, the syllabus will depend upon the 10+2 and undergraduate level like Trigonometry, Algebra, Calculus, and Geometry. The Postgraduate Courses will have a subject like Mathematics, Statistics, and Probability. The applicant who applying for the ISI Exam 2019 has to start the preparation. As the competition is going to be very tough for all the candidates. Also, the number of seats is very less as compared to the competitors. So we are providing here the some ISI Exam Preparation Tips. First, gather the exact syllabus from the official website of ISI Institute. Once you get the syllabus, you should make the strategy to cover the entire syllabus. Divide the syllabus into easy, medium, hard topics and give them time according to your needs. You have to make your routine with effective Time management which will utilize your time effectively. Speed and accuracy are very important to get a high score, so you should practice more to get the required speed and accuracy. Try to make your own notes from the books you are referring so that it will help you to grab the things perfectly. Take 5 minutes break as a stress buster, don’t stress yourself out. Sample papers have the questions of the previous examination which cover all most all the topics in the syllabus. Sample papers are very helpful because they not only cover the topics of entire syllabus but also cover topics which are not given in the books but also have the question which is asked in the previous ISI Exam. ISI Exam Sample Papers will help the applicant to avoid the silly mistakes and improve overall concepts of the syllabus. In every examination, some of the questions are from the sample papers only. The Online Mock test of Sample paper will help you to know where you stand before the exam and how you can improve. The admit card will be available on the portal of the official website where you can login into the account and print it down after 2nd week of the April 2019. The applicant will receive a link on the portal to download the admit card. Once you downloaded the ISI Hall Ticket 2019, take the print out of the admit card (at least 2 copies). Paste recent size photo which you uploaded while filling the application form and sign it. The result of the ISI Exam will be declared in the month of June 2019. It will be available on the official website of the ISI Exam Result 2019 i.e.www.isiscol.ac.in/index.php. So the applicant can see their result by entering their roll number and name. Once the Examination is executed, the Answer Key will be released within few days of the examination held. ISI Exam Answer Key will be also available on the official website. The cut off marks are the minimum required marks to qualify the exam for the next process of counseling. On the basis of Cut-Off marks, the Rank List/Merit list will be prepared and released. The prosperous candidate in the ISI 2019 will be shortlisted and called for the personal interview round. The applicant who elected should download their ISI Call Letter to take part in the counseling process. The candidate required to bring their document for the verification during the counseling process. The final selection is done if you are selected in counselling.